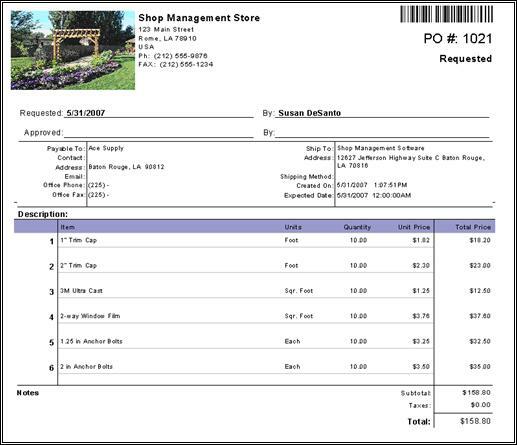 Purchase orders are used to document purchases of items or services used to run your company. They can be sent directly to a vendor or used internally to help keep track of these items and services your company is buying. A purchase order can also serve as authorization to place an order. Information usually included on a purchase order are the vendor, the items or service being requested, quantity, price, delivery terms, and payment terms. Your company must have Purchase Orders enabled in System Setup to access this feature. Every company will have different ways of handling their purchase orders. Below is the most common order of events when using purchase orders. Purchase order is created, approved, and if necessary, delivered to the vendor. Item(s) are received with a bill and the purchase order is closed, or items are received. Then, the bill is sent separately, and the purchase order is closed. Below is a brief description of each status, please keep in mind that depending on how your business is setup and the authority you give your employees regarding purchases from Vendors will determine which statuses you commonly use when dealing with PO's. Every status does not have to be used and depending on the case some can be skipped completely. The rules for how these are used is entirely based upon your own internal policies. Purchase Orders do not have any “accounting” impact on any of your reports. Requested is the default status of all purchase orders. This is a holding status, many users allow all their employees to enter PO's then have a manager or other staff approved the PO's prior to actually ordering anything from a vendor. Approved is used to approve the purchase orders your staff has entered into the system. Once approved the person responsible for vendor purchasing can proceed with processing the purchase order by contacting the vendor. Ordered is the status set on a purchase order once the ordering process has actually been completed. This helps to distinguish which items are on order from your vendors. Received is typically used when there is a purchase of goods that you will take possession of through delivery or pickup. This status is typically only used as a holding status for items that have been received however the bill (invoice) from the vendor has not been received or entered into Control. Closed is the final status of a PO. This status should be used once the PO has been received and is complete. Cancelled is used to cancel the PO, similar to the Void status that is associated with estimates and orders. Rejects the PO, this helps to differentiate rejected PO's from cancelled ones. The rejected status is typically used on something that was never approved, whereas the cancelled status should be used on PO's that were approved then later cancelled. Purchase orders are created by going to Vendors > New > New Purchase Order and filling in the necessary information, such as vendor name, items ordered, and expected method of payment. Click the Save button on the right of the screen to save your purchase order. To close a Purchase Order after items have been received and the bill has come in, click the Status button on the Action Toolbar and select Closed. POs never create General Ledger entries or affect the Balance Sheet. However, they can affect inventory when they are for parts that are inventoried. When a PO is Requested or Approved, the assumption is that it has not been ordered (and may or may not actually be in the future). Therefore, there is no accounting consideration given to the PO. It is analogous to an “estimate” stage for the order. When the PO is Ordered, Control will adjust the On Order level for inventoried parts to show that the items have been ordered. When the PO is Received or Closed, Control will decrease the On Order level (if this stage was used) and increase the Received Only inventory level. When the PO is Cancelled or Rejected, any inventory increases will be backed out. This is a purchase order that has been created in Control; it can be printed out for internal use or to send to a vendor to order materials or supplies. This gives a list of purchase orders in a chosen date range, with the vendor, status, created date, and total if available.